By Kori ~ January 11th, 2012. Kori S. Voorhees, our Wine Peeps Editor-in-Chief, has been a contributor to Washington Tasting Room Magazine, a quarterly magazine that focuses on Washington State wine with articles about wineries, vineyards, travel, and lifestyle. The following article, written by Kori, appeared in the Summer 2011 issue. 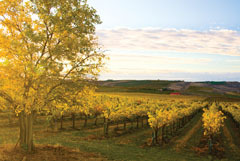 Northwest wineries have been banking on grapes from Sagemoor Vineyards for decades. With novel ideas and deep passion, this powerhouse vineyard team continues to supply winemakers with the right stuff. The late Alec Bayless, an attorney from Seattle, was the mastermind behind what is today known as Sagemoor Vineyards. This pioneer vineyard, founded in 1968, supplied grapes to a number of Washington and Oregon wineries during those early days that helped put the wine industry in the Pacific Northwest on solid footing. There are four individual vineyard sites in all, consisting of Sagemoor, Bacchus, Dionysus and Weinbau that make up what is officially known as Sagemoor Vineyards. Weinbau is located 12 miles east of Mattawa on the Wahluke Slope, while the other three are located within miles of each other north of Pasco, Washington, on a spectacular site overlooking the Columbia River to the west. â€œAt 900 acres in size, we are probably the largest â€˜boutiqueâ€™ vineyard in the state because we do not have our own winery,â€ says general manager Kent Waliser. Since he joined Sagemoor in 2002, Waliser has embraced the idea of working with a large number of grape buyers, both big and small. At last count they sell grapes to over 75 wineries, including Abeja Winery, Barrister Winery, Efeste, Hedges Family Estate, Januik Winery, Lâ€™Ecole NÂº 41, Rasa Vineyards, Ste. Michelle Wine Estates, Walla Walla Vintners, and Woodward Canyon Winery. Not only does this practice provide diversification, it best utilizes the makeup of some vineyard sites which donâ€™t ripen evenly (due to variability in soils and topography) and therefore do not appeal to large commercial customers who are looking for uniformity so they can make mass quantities of wine in a consistent style. 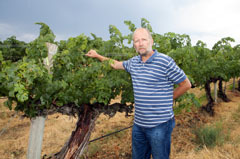 Former vineyard manager Todd Cameron mapped the vineyard block and divided them up into smaller rows, or individual sections as they are called. Todd then determined the irrigation and viticulture plan appropriate for each block. Now, each newly planted block takes into account many variables that make sure each grape variety will grow best there. As a result, they have become very attractive to boutique winemakers who want to claim these smaller sections as their own. Sagemoor is known for producing some of the best Cabernet Sauvignon in the State of Washington, particularly the 1972 Old Vine Cab in block 9 of Bacchus Vineyard. â€œIt has a really nice core of dark fruit and there is a brown herbaceous signature to Sagemoor,â€ says John Abbott, owner and winemaker for Abeja Winery. At the same time Sagemoor has developed a modern niche growing lesser-known varieties that are not commonly found elsewhere in the state including Barbera, Roussanne, Carmenere, Malbec, Petit Verdot and Cab Franc. Not content to rest on their laurels as one of the top vineyard growers in the state, Sagemoor Vineyards are progressive in their practices. â€œThe vineyard team understands that they need to continue to farm for better and better fruit. They are willing to work with each winemaker to produce the fruit that each winery is looking for, which is unique. Iâ€™m a believer in softer farming, which is a direction that Sagemoor is also willing to go, not only to produce better fruit but also to protect the health and happiness of their workers,â€ says Abbott. About five years ago, Waliser started using a product called Extenday in the Old Vine Cab block 10. As a tree fruit grower, Waliser had experience using the white reflective material to advance the maturity of cherries and apples more quickly in the growing season, and he wondered if it could help the 1972 block, which tended to ripen late. His hunch paid off. Using Extenday has allowed Sagemoor to gain heat units and advance maturity by a week to ten days. 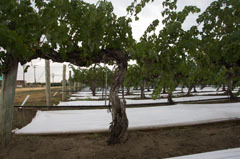 John Abbott has worked with Waliser to test the effectiveness of Extenday on these grapes by comparing rows that had the material on them versus rows that did not. â€œIt definitely made a difference,â€ says Abbott. Even though Sagemoor is a large operation in terms of acreage, they work hard to make sure that each customer is taken care of and their needs are met. Derek Way, vineyard manager, together with Servando Rodriguez and Miguel Rodriguez, have over 70 combined years experience working with winemakers. They know that customer service is critical for success, and they seem to have a lot of fun in the process. Rick Small recalls the fabulous BBQ parties that the original partners would throw for their shareholders. True to their roots, Sagemoor still holds an annual tasting for their winery partners. Itâ€™s not only a time to celebrate and enjoy each otherâ€™s company but also a time to discuss what is working and what could be improved. â€œItâ€™s almost like a family over there, and I feel like Iâ€™m a part of that family. They just take great care of the vineyard, and they take really good care of the wineries that get grapes from them,â€ says Small.